1. For the Banbury cake, melt the butter in a saucepan, add the sugar and heat until the mixture begins to bubble. 2. Remove the pan from the heat and stir in the currants, vinegar and spices. Allow to cool a little and add the zest, sherry, orange flower water and mixed peel. Stir thoroughly and set to one side. 3. Roll out the pastry on a cold surface to 3mm thick. Cut out circles using a 15cm pastry cutter and brush the circles with egg wash. Place 1 teaspoon of the filling in the centre of the circles and fold in the pastry to cover the filling. Press together to seal then turn each cake over and slash the top with a knife 3 times. 4. Rest for at least 30 minutes in the fridge then brush the surface with egg wash again. Meanwhile, preheat the oven to 200˚C, gas mark 6. Bake for 20–25 minutes, until golden and cooked. 5. For the potted Stilton: put the Stilton, mascarpone, butter and salt into a bowl and blitz with a hand-held blender until it becomes a smooth and homogenous mixture. Gently warm 55g water and the sherry vinegar together then slowly add this mixture to the cheese. Pour in the PX sherry and mix carefully. 6. Decant into small ramekins and put in the fridge to set. 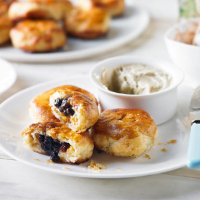 Take the ramekins out of the fridge 10 minutes before serving with the Banbury cakes.